Not to be confused with Bolshoi Theatre, Saint Petersburg. The Bolshoi Theatre (Russian: Большо́й теа́тр, tr. Bol'shoy Teatr, Big Theatre, IPA: [bɐlʲˈʂoj tʲɪˈatər]) is a historic theatre in Moscow, Russia, originally designed by architect Joseph Bové, which holds ballet and opera performances. 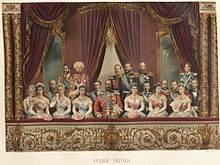 Before the October Revolution it was a part of the Imperial Theatres of the Russian Empire along with Maly Theatre (Small Theatre) in Moscow and a few theatres in Saint Petersburg (Hermitage Theatre, Bolshoi (Kamenny) Theatre, later Mariinsky Theatre and others). The Bolshoi Ballet and Bolshoi Opera are amongst the oldest and most renowned ballet and opera companies in the world. It is by far the world's biggest ballet company, with more than 200 dancers. The theatre is the parent company of The Bolshoi Ballet Academy, a world-famous leading school of ballet. It has a branch at the Bolshoi Theater School in Joinville, Brazil. The main building of the theatre, rebuilt and renovated several times during its history, is a landmark of Moscow and Russia (its iconic neoclassical façade is depicted on the Russian 100-ruble banknote). On 28 October 2011, the Bolshoi re-opened after an extensive six-year renovation. The official cost of the renovation is 21 billion rubles ($688 million). However, other Russian authorities and other people connected to it claimed much more public money was spent. The renovation included restoring acoustics to the original quality (which had been lost during the Soviet Era), as well as restoring the original Imperial decor of the Bolshoi. The company was founded on 28 March [O.S. 17 March] 1776, when Catherine II granted Prince Peter Ouroussoff a licence to organise theatrical performances, balls and other forms of entertainment. Ouroussoff set up the theatre in collaboration with English tightrope walker Michael Maddox. 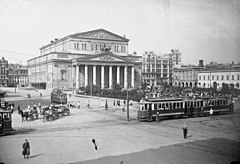 Initially, it held performances in a private home, but it acquired the Petrovka Theatre and on 30 December 1780, it began producing plays and operas, thus establishing what would become the Bolshoi Theatre. Fire destroyed the Petrovka Theatre on 8 October 1805, and the New Arbat Imperial Theatre replaced it on 13 April 1808, however it also succumbed to fire during the French invasion of Moscow in 1812. 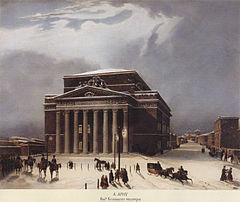 The first instance of the theatre was built between 1821 and 1824, designed and supervised to completion by architect Joseph Bové based upon an initial competition-winning design created by Petersburg-based Russian architect Andrei Mikhailov that was deemed too costly to complete. Bové also concurrently designed the nearby Maly Theatre and the surrounding Theater Square, The new building opened on 18 January 1825 as the Bolshoi Petrovsky Theatre with a performance of Fernando Sor's ballet, Cendrillon. Initially, it presented only Russian works, but foreign composers entered the repertoire around 1840. In 1843 a large-scale reconstruction of the theatre took place using a design by A. Nikitin, but a fire in 1853 caused extensive damage and so a further reconstruction was carried out, by Alberto Cavos, son of the opera composer Catterino Cavos. 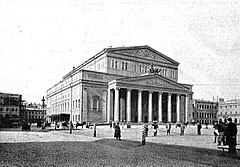 On 20 August 1856, the Bolshoi Theatre reopened. Other repairs of the building took place in 1896. On 7 December 1919 the house was renamed the State Academic Bolshoi Theatre. Only a few days later, however, on 12 December, there was an unsuccessful attempt to shut the institution entirely. Beethoven Hall opened on 18 February 1921. Ivan Rerberg directed further reconstruction of the theatre between 1921 and 1923. A bomb damaged the structure during World War II, but this was promptly repaired. 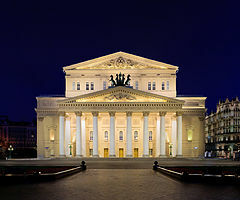 A new stage for the Bolshoi Theatre, called the New Stage, went into service on 29 November 2002, constructed to the left of the theatre's historic main stage. Together with auxiliary buildings — a restored 17th-century building, two rehearsal halls, and artists' recreation rooms — it forms a single theatre complex, the Bolshoi Theatre of Russia. The new building is on a natural hill which it shared, until recently, blocks of old houses with communal apartments. From July 2005 to October 2011 the theatre was closed for restoration. It had undergone many renovations in its time, but none as extensive. The building, whose architecture combines three different styles, was damaged and a quick renovation seemed to be necessary. Repairs were initially estimated at 15 billion rubles ($610 million) but engineers found that more than 75% of the structure was unstable, and as a result the cost estimate jumped to 25.5 billion rubles (app. $850 million). At the completion of the work, however, it was announced that only 21 billion rubles ($688 mil) had been spent. According to The Moscow Times, the true cost may have been double that, and Der Spiegel quotes a figure of $1.1 billion. The rebuilding and renovation was funded entirely by the federal government. The orchestra of the Bolshoi Theatre is a virtuoso ensemble in its own right. It gives occasional concerts of symphonic music in the theatre and elsewhere, and has made recordings. Over the decades, it has toured overseas as the "Bolshoi Theatre Orchestra," the "Bolshoi Symphony Orchestra" and, most recently, as the "Bolshoi Orchestra." Music director and chief conductor, Vassily Sinaisky, quit abruptly at the start of December 2013, after a 41-month tenure, citing the need to avoid conflict. General director Vladimir Urin promptly accepted his resignation and selected Tugan Sokhiev as replacement. Sokhiev's four-year contract, settled on 20 January 2014 and became effective immediately. The new chief also holds conductorships in Toulouse and Berlin. The Bolshoi Theatre is world-famous and attracts large numbers of tourists. As a result, prices can be much higher than in other Russian theatres. This is especially the case for ballet, where prices are comparable to those for performances in the West. For local citizens, concerts and operas are still relatively affordable, with prices ranging from 100 rubles (≈$1.5) (for students, for balcony seats for matinée performances) to 15,000 rubles (≈$230) (for seats in the orchestra or stalls). Anastasia Volochkova, a former Bolshoi prima ballerina, has said she sees the theatre "as a big brothel" because, she has claimed, ballerinas are invited to parties by theatre administrators and refused roles if they do not accept. In the area of box office, a theatre insider told the German publication Der Spiegel that tickets are often sold to mafia dealers, who in turn sell them on the black market for double the face value. Performance quality has been criticized by the former music director Alexander Vedernikov (2001-2009). He has claimed the Bolshoi Theatre was putting "bureaucratic interests before artistic ones." July 8, 2017, three days before the premiere, the Bolshoi Theatre called off the premiere of a ballet about legendary dancer Rudolf Nureyev. The Director General Vladimir Urin claimed it was due to the bad quality of the dancing, however the principal dancer Maria Alexandrova claimed it was the first sign of a 'new era' of censorship. It was the first time a show has been pulled in such a way since the collapse of the Soviet Union, sparking rumours about the motivation behind it. ^ "Mission". Bolshoi Theatre. Retrieved 20 October 2018. ^ a b c d Elder, Miriam (22 March 2011). "Bolshoi rocked by scandal and intrigue". The Guardian. Manchester. Retrieved 22 May 2017. ^ a b Tabakov, Igor (27 October 2011). "Bolshoi Theater to reopen after restoration". The Moscow Times. Retrieved 22 May 2017. ^ a b c d e Beyer, Susanne; Bidder, Benjamin; Pyljow, Wladimir & Schepp, Matthias (30 January 2013). "Jealousy and corruption rumors surround attack on Bolshoi director". Der Spiegel. Retrieved 22 May 2017. ^ "In Short". Bolshoi Theatre. Retrieved 20 October 2018. ^ "History". Bolshoi Theatre. Retrieved 20 October 2018. ^ Andrew Osborn (27 Oct 2011). "The Bolshoi Theatre: a rich history". Daily Telegraph. ^ "История Большого театра". www.bolshoi.ru. Retrieved 26 March 2018. ^ Brumfield (2 December 2013). "Landmarks of Russian Architect". Routledge. Retrieved 26 March 2018 – via Google Books. ^ Van Gelder, Lawrence (4 February 2008). "Saving Bolshoi Theater". The New York Times. Retrieved 22 May 2017. ^ "Bolshoi Theater raises curtain after six-year restoration". RIA Novosti. 28 Oct 2011. Retrieved 29 Oct 2011. ^ Baldwin, Chris (31 January 2008). "Bolshoi to reopen late in 2009 after rescue work". Reuters. ^ "The Theatre: Reconstruction". Bolshoi Theatre. Retrieved 22 May 2017. ^ "Turmoil on the Tarmac". Time. 3 September 1979. (Subscription required (help)). ^ "Today in History - September 18". World ofQuotes. Retrieved 22 May 2017. ^ "Brouhaha at the Bolshoi". Time. 1 October 1979. (Subscription required (help)). ^ Stott, Michael (13 July 2009). "Conductor exits left as Bolshoi Theatre's woes mount". Reuters. ^ Ferris-Rotman, Amie (21 September 2010). "New musical director opens Bolshoi's 235th season". Reuters. Retrieved 2011-06-01. ^ "Bolshoi boss Sergei Filin leaves hospital for Germany". BBC News. 4 February 2013. ^ "Maria Alexandrova Instagram Post". Instagram. 8 July 2017. Retrieved 11 July 2017. ^ "Bolshoi Theatre postpones Rudolf Nureyev ballet". BBC News. 11 July 2017. Retrieved 11 July 2017. The Bolshoi Kamenny Theatre used to exist in Saint Petersburg. 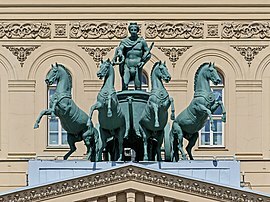 It stood next to the Circus Theatre (rebuilt in 1860 as the Mariinsky Theatre), but was replaced in the 1890s by the present-day building of the St. Petersburg Conservatory. 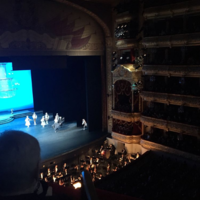 It was at St. Petersburg's Bolshoi that the first great Russian operas, Glinka's A Life for the Tsar and Ruslan and Lyudmila, premiered.